SleepSense joins a growing number of on-bed sleep trackers, though its connection to Samsung TVs and appliances could be its standout feature. There’s no shortage of devices these days that will track your sleep, but Samsung’s SleepSense is going a little further in helping you doze off in the first place. The slim device slips under a mattress and uses a contactless sensor to measure movements, heart rate, and respiratory rate. As the night goes on, SleepSense tracks how long it took to fall asleep, total sleep time, sleep efficiency, the number of times you wake up or get out of bed, and percentage of REM and deep sleep, all contributing to a general sleep score. Samsung also worked with a Harvard Medical School professor on sleep tips, which the SleepSense app will tailor to your own sleep patterns. You can already find similar features in competing products such as the Luna mattress cover, Withings Aura, and Beddit tracker, along with numerous wearable sleep trackers and smartphone apps. 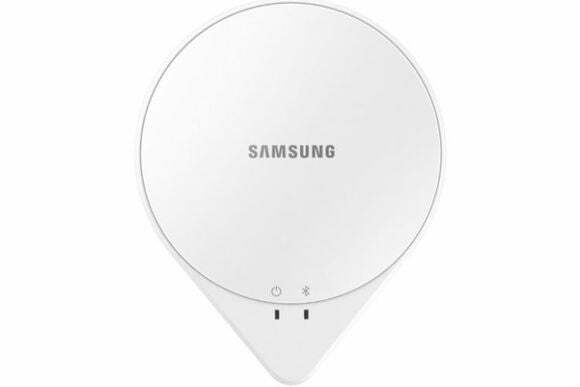 Where Samsung stands out is its promise to connect with various Samsung devices and home appliances. For instance, SleepSense could turn off your bedroom TV as you fall asleep so you don’t have to deal with sleep timers, or adjust the air conditioning when the room gets too stuffy. VentureBeat reports that the device will have its own app, though it’ll also connect with Samsung’s SmartThings app that controls a broader range of appliances. It’s worth noting, however, that these are just promises for now. Samsung hasn’t said specifically which appliances it will support, and there’s no word yet on a price or release date. It’s also unclear whether the device will work with someone else in the bed. Why this matters: Today’s sleep trackers are pretty good at telling you how well you slept, but that information can be more frustrating than helpful if you have trouble falling asleep or staying asleep throughout the night. Samsung’s attempts to create an ideal sleeping environment could give it an advantage, though other devices like Jawbone and Misfit are in pursuit of the same goal as they try to connect with a wider range of connected home products about your sleep habits.